A brand new TEN MINUTE routine for your Christmas show that packs flat, plays big and will have the kids on the edge of their seats! This routine has it all! It begins with Rudolph with a big blue nose. 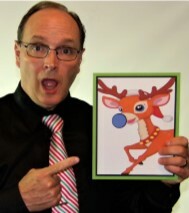 "It got SO cold in the North Pole boys and girls that Rudolph's nose turned blue!" With hilarious patter, Mrs. Claus takes Santa's hat and covers Rudolph's nose to try and warm it up. But the next morning, upon removing the hat it is discovered that Rudolph's nose got even colder and it turned purple! Oh no! The act of covering his nose is repeated four times in the routine, each time with the patter getting funnier and more suspenseful. His nose turns white and is completely frozen! Then it turns . . . green with yellow polka dots? Huh??? During this entire succession of color changes there is very funny patter between Santa and Mrs. Claus as to whether to cancel Christmas. (Yes, the card may be turned around.) 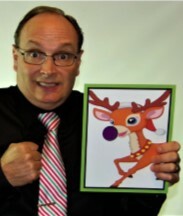 After the nose turns green with polka dots, you tell your audience of children that for many years Christmas had to be cancelled because Rudolph's nose just would not cooperate. "Then something happened boys and girls. Global warming! 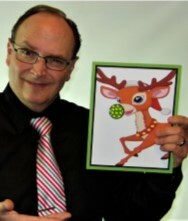 Good for you boys and girls and good for Rudolph because. . . his nose turned RED again! And there was a Christmas every year after that." But the fun does NOT stop there! Other Reindeer: You can't play hide and seek. You have a red nose! Other reindeer: No, you see Rudolph, if we let you play hide and seek, your red nose will glow and we will easily find you. 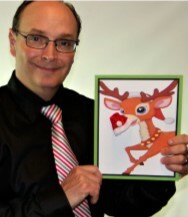 So they let Rudolph play and he won! And he won again and again! At the end of the game they could never find him and all the reindeer would have to shout out "Come out, come out, wherever you are!" And Rudolph would magically appear inside his stable, peeking out his window and the reindeer never knew how he got there! 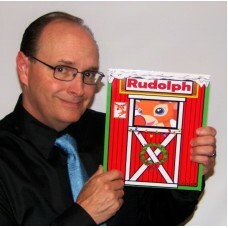 You place Rudolph into his house so the kids can see him thru the window. Then you remove him and the fun continues by hiding him among Dasher and Dancer. 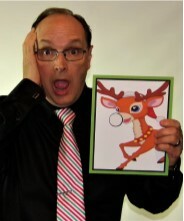 Try as they may, the children can never find Rudolph. Then he disappears altogether! The routine ends with all the children shouting "Come out, come out, wherever you are!" 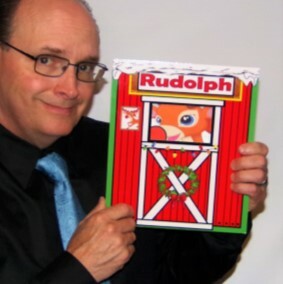 In an instant, Rudolph magically appears back in his stable, looking out his window. Very visual magic! Is this REALLY a ten minute routine? Yes! The stable is made of very durable PVC with digitally printed graphics. The stable has it's own easel attached to the rear side and will last a lifetime with good care. The cards are printed on triple layer trifecta stock. 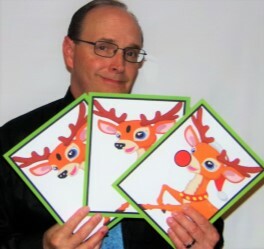 The color changing Rudolph card is cleverly gimmicked and very easy to operate. The cards measure 8" X 10" with the stable measuring approximately 9" X 12". Extremely easy set up that takes ten seconds which is so important for children entertainers traveling show to show during the Christmas season. Everything included: Stable, all necessary cards, little tiny Santa hat and COMPLETE word for word patter which you can change to fit your style if you feel a need. A wonderful fresh, new routine that you will enjoy performing. And just think . . . if you're performing a 40 minute performance, this routine is 1/4 of your show!